Considering that GOP outperformed the polls and almost upended Dems in 2013 and 2014, Team Gillespie has reason to be thrilled with a tie. 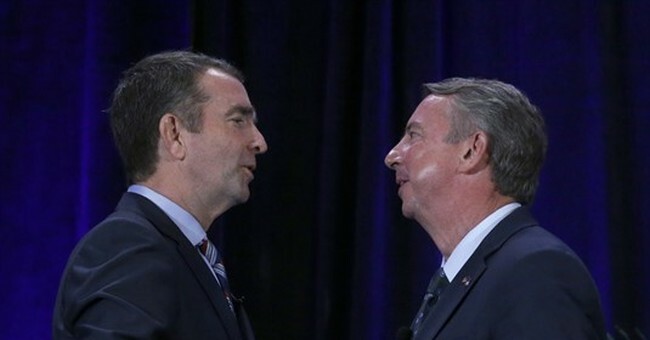 Virginia’s Democratic gubernatorial contender Ralph Northam raised more than twice as much money this summer as Republican opponent Ed Gillespie and had a war chest twice as large heading into the last two months of the campaign, according to finance reports. In July and August, Northam raised $7.2 million, while Gillespie took in $3.7 million in the same period. That left Northam, the sitting lieutenant governor, with $5.6 million in cash to Gillespie’s $2.6 million as of Aug. 31, according to data released Saturday by the nonprofit Virginia Public Access Project. Northam’s summer fundraising reverses a 2-to-1 cash advantage that Gillespie held immediately after the June 13 primary. Northam spent most of his early money on the primary contest to defeat former congressman Tom Perriello for the Democratic nomination while Gillespie had conserved funds in his primary match against Corey A. Stewart. The two nominees meet for a debate later this evening.